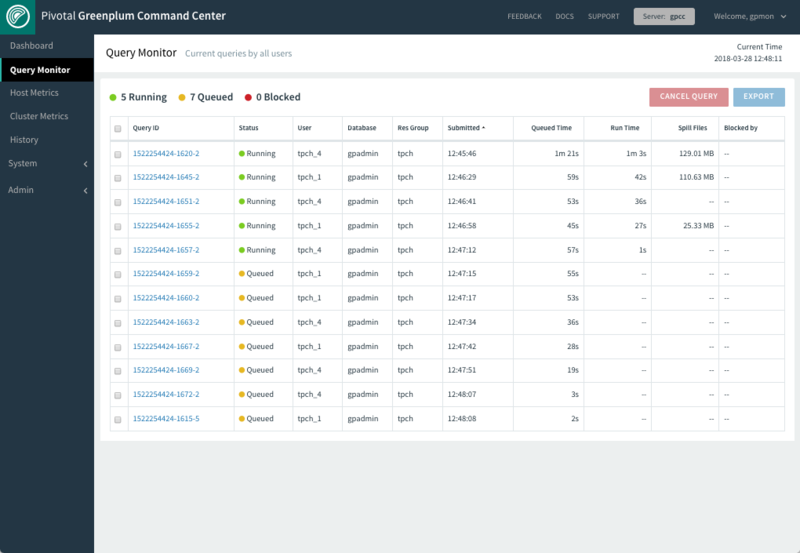 The Query Monitor view allows you to view information for all Greenplum Database server queries, including details about queries running, queued to run, and blocked by other queries. Users with Admin or Operator permission can see and cancel all users’ queries. If a Command Center administrator has enabled Query Monitor Guest Access, anyone able to access the Command Center web server can view the system status and query list on this page without signing in to Command Center. Anonymous users, however, cannot cancel queries or access any other Command Center features. Understand how the system is being used — both in real-time and trending over time. Identify and diagnose problem queries while they are running, detect skew, find runaway queries, and so on. Review and balance the query load on the system by better optimizing and scheduling the query load. Cancel queries that disrupt system performance. The Query Monitor table displays the following columns for queries. An identification string for the query. If the column is blank, no query ID has been assigned yet. In the Console, this looks like “1295397846-56415-2”. Command Center generates this ID by combining the query record’s tmid, ssid, and ccnt fields. tmid is a time identifier for the query. ssid is the session id. ccnt is the number of the command within the session. The Greenplum Database role that submitted the query. The name of the database that was queried. The resource group or resource queue that is managing the query. The time the query was submitted to the query planner. The amount of time the query has been (or was) in queue awaiting execution. The amount of time since query execution began. The total size of spill files created for the query. Greenplum Database creates spill files when there is insufficient memory to to execute the query in memory. See Managing Spill Files Generated by Queries for information about spill files. Shows the number of locks blocking the query. Hover over the column to display details of the locks. The tip shows the type of each lock, the ID of the transaction or query that holds the lock, and the amount of time the query has been blocked. Click a column heading to sort the rows on that column in ascending or descending order. Click the checkbox at the left of a row to choose a query to cancel or export. Click the checkbox in the heading row to choose all queries. Click Cancel Query to cancel selected queries. Click Export to download a comma-separated values (CSV) text file containing rows for the selected queries. When no queries are selected, all rows are exported. The default file name is spreadsheet.csv. Click any query ID to see the Query Details, including metrics, the text of the query, and the query plan.